Nigiri is a specific type of sushi consisting of a slice of raw fish over pressed vinegared rice. Sashimi refers to just slices of very fresh fish or meat served raw, often over a bed of shredded daikon radish. 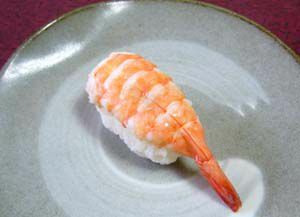 Typical oval shaped sushi are called nigirizushi and boiled shrimp is a popular topping. Shrimp nirigizushi is called ebi nigiri. The shrimp has a very nice slightly sweet flavor that goes very well with the rice and it also looks pretty. Although most people think of raw fish when they think of sushi, the shrimp is actually ​parcooked. Let's learn how to make shrimp nigirizushi at home. Prepare sushi rice by mixing vinegar mixture in steamed Japanese rice. Wet your hands with some sushi vinegar mixture used to make sushi rice. Take some sushi rice in your hand. Lightly shape it into an oval mound. Use raw shrimp with the shells on. It is not important to have the heads. Shrimp without the shells are usually curled and you want straight shrimp for this. Cooking the shrimp with the shells on also helps to give them a pretty pink color. Take a piece of flattened shrimp in the other hand. Put a dab of wasabi (Japanese horseradish) on the belly side of the shrimp. Place the sushi rice on top of the shrimp. *The wasabi should be placed between the sushi rice and the shrimp. Lightly press the sushi rice with your fingers. it helps to shape them when the rice is still slightly warmer than room temperature and to wet your hands with a mixture of rice vinegar and cold water. Roll the sushi over so that the shrimp side comes on top of the rice. Lightly press the shrimp side with your fingers. Turn the sushi around so that the tail of the shrimp comes toward you. Again, lightly press the sushi with your fingers. Serve the sushi with soy sauce on the side.